County General Hospital in Jefferson, Los Santos. 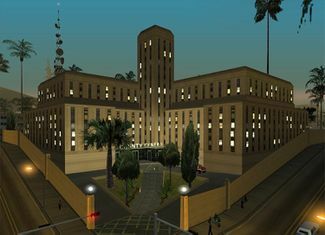 County General Hospital is a hospital in Grand Theft Auto: San Andreas located in Jefferson, Los Santos. It is one of two hospitals in the city, the other being All Saints General Hospital located further west in Market. The hospital is located in a Ballas controlled area but is also used by the Grove Street Families, Los Santos Vagos, and the Varrios Los Aztecas gangs. Players who die on the eastern half of Los Santos, or die the closest to the hospital are likely to respawn here. The hospital includes a parked Ambulance which can be used to complete Paramedic side missions, and a Gang Tag is located on a wall of the hospital. A sniper rifle can also be found on the hospital roof. Los Angeles, which Los Santos is based on, features a similarly named Los Angeles County General Hospital. While both hospitals are designed in an Art-Deco design, they share very little similarity in facade design or even color, although both hospitals do feature a crowning tower. This page was last modified on 29 May 2015, at 04:58.